The above figure depicts the rectangular swimming pool at an apartment. The apartment manager needs to purchase a tarp that will cover this pool completely. However, because of the cutting device the pool store uses, the length and the width of the tarp must each be a multiple of three yards. Also, the tarp must be at least one yard longer and one yard wider than the pool. What will be the minimum area of the tarp the manager purchases? Three feet make a yard, so the length and width of the pool are yards and yards, respectively. Since the dimensions of the tarp must exceed those of the pool by at least one yard, the tarp must be at least yards by yards; but since both dimensions must be multiples of three yards, we take the next multiple of three for each. 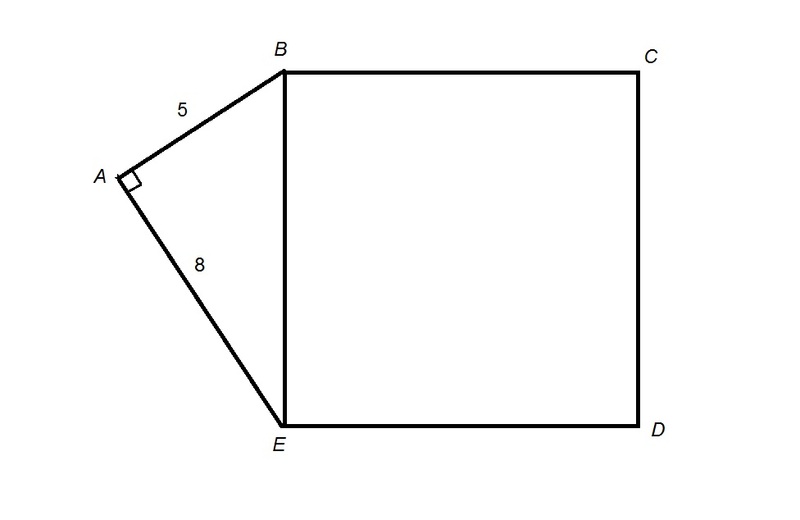 Refer to the figure above, which shows a square inscribed inside a large triangle. 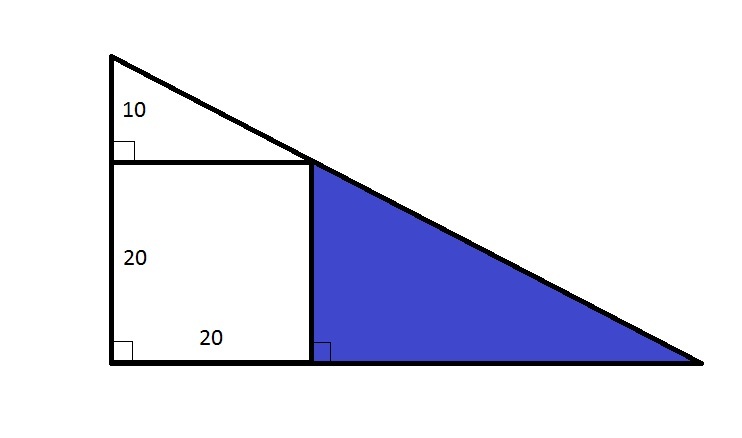 What percent of the entire triangle has been shaded blue? Insufficient information is given to answer the question. The shaded portion of the entire triangle is similar to the entire large triangle by the Angle-Angle postulate, so sides are in proportion. The short leg of the blue triangle has length 20; that of the large triangle, 30. Therefore, the similarity ratio is . The ratio of the areas is the square of this, or , or . The blue triangle is therefore of the entire triangle, or of it. Refer to the above diagram. 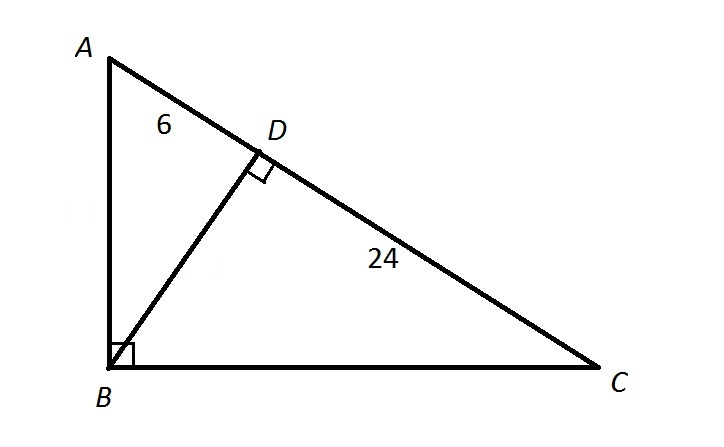 What is the area of ? Insufficient information is given to answer the problem. The above figure depicts the rectangular swimming pool at an apartment. The apartment manager needs to purchase a tarp that will cover this pool completely, but the store will only sell the material in multiples of ten square yards. How many square yards will the manager need to buy? The manager will need to buy a number of square yards of tarp equal to the next highest multiple of ten, which is 200 square yards. Refer to the above diagram. In terms of area, is what fraction of ? Insufficient information is given to answer this question. Therefore, in terms of area, is of . Refer to the above diagram. Give the ratio of the area of to that of . 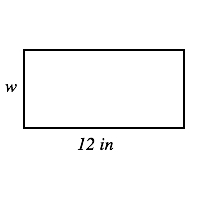 The ratio of the areas is - that is, 4 to 1. Refer to the above figure. Quadrilateral is a square. What is the area of Polygon ? Insufficient information is given to calculate the area. Polygon is a composite of and Square ; its area is the sum of the areas of the two figures. Square has area the square of this, which is 89. Find the area of a circle with a diameter of . Write the formula for the area of a circle. Substitute the diameter and solve. 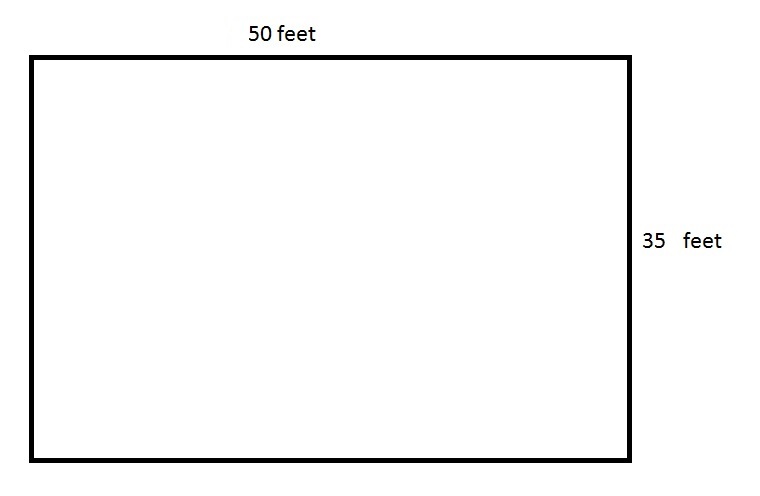 Find the area of the rectangle above when the perimeter is 36 in. Side w is 6 in long. Now that we know that side w is 6 inches long, we have everythinng we need to calculate the area of the rectangle. Which of the following shapes is a kite? A kite is a four-sided shape with straight sides that has two pairs of sides. Each pair of adjacent sides are equal in length. A square is also considered a kite.